Below are the two paintings that I worked on for the last 2 weeks of class at Studio Escalier. I needed a little distance before I posted them. As I was working I became so frustrated and even sad. I felt that I had wasted my time, hadn’t learned anything, the painting was terrible. 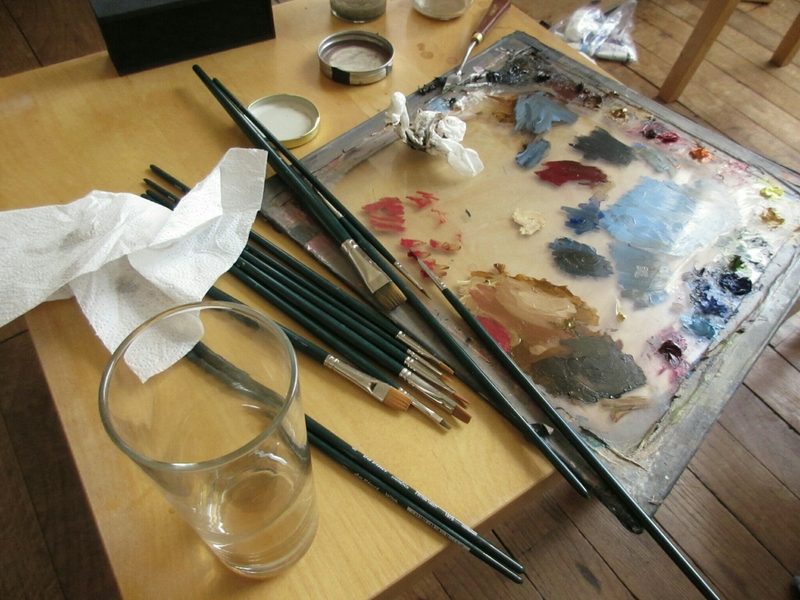 I had a day where I simply stopped painted and curled up into a ball in the studio. Looking at the unfinished images below I am now very happy with my progress. I have learned a great deal in a VERY short period of time and feel accomplished. There is much work to do as I continue to develop my abilities, but I can certainly see that it is worth the effort. I began painting this summer with zero experience in blending colors or how to use the paints properly. In addition to playing catch up with these skills, I was learning an extraordinary way to look at and appreciate light and the body. I think a little time to marinate these things together will be good. In October I will begin a portrait and still life class with Watts Atelier. The adventure continues! Well I’ve fallen out of time with my posts here, but better late than never. I hope to access these in the future and think, “Wow, I’ve come so far, I’m such a master that I must hide all of this poor work!” But then I won’t hide it because that’s too much work. The weekend excursion was wonderful and much needed. I am so happy here in Argenton in retreat mode. It is a very focused environment with few distractions. But sometimes you just need a change of scenery! Getting out is difficult – Argenton is VERY remote and we don’t have cars. Busses are sporatic and mostly unhelpful to go any great distances. Taxis are prohibitively expensive. It took a very motivated person to arrange rental cars that brought us to our destinations. A group of fellow artists and I visited Il de Re to see donkeys wearing pants, a lovely beach town and enjoy a beautiful warm beach. The second day we visited Tours to see the Tours Cathedral (stunning example of Gothic architecture), Chateau Villandry and enjoyed dinner in Chinon. The goal for our three week poses is to develop them into paintings (if we like) with the benefit of completing a drawing first. A solid painting starts with a great drawing. I drew, used tracing paper to copy my drawing and then transferred the image to the prepped canvas. My issues are becoming less extreme. I was able to reign in the arms and legs for both poses and they seem quite proportionate. 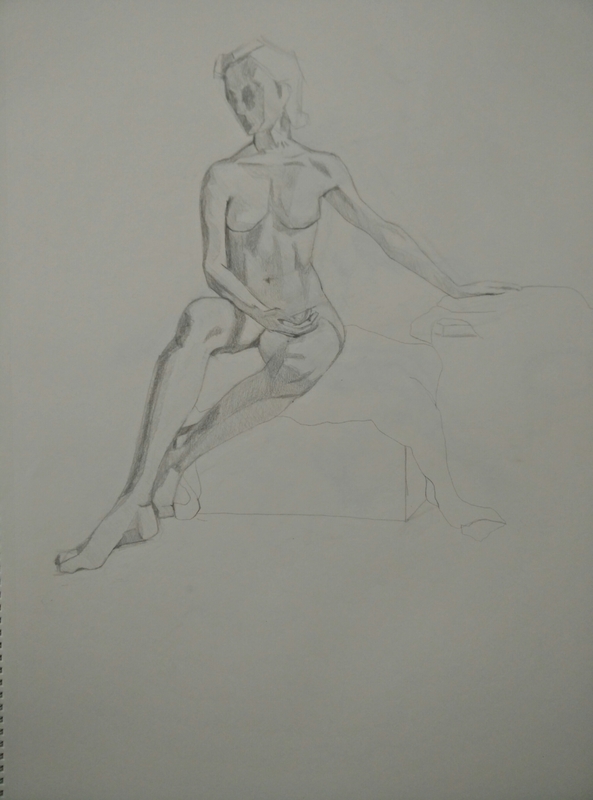 Most of the corrections I received in my crits were for small details within the pose. Now I’m getting into a shortage of understanding of anatomy. Must remember to TAPER, TWIST and TURN. Don’t worry if you don’t understand that, mostly a mental note for myself. So Week 9 was characterized by preparing drawings for painting. Week 10 was all about painting. I completed 3 poster studies. One was terrible so I did a second. I think I finally turned a corner with poster studies. No more technicolor crazy colors – keeping things subtle, keeping things similar. Big DUH moment for me. I was able to transfer my drawings to linen and begin painting. The first two days of painting I was overjoyed and really celebrating in my mastery. The third day I wanted to crawl into a hole and never paint again. I confess I sorta gave up on Thursday and just started “doing whatever”. The instructor mentioned a Manet type quality, which makes me think Impressionism may have come from a feeling of hopelessness rather than intellectual pursuit. Poster study one. Bad. Poster study two. Better. PM Pose and transfer materials. Other poster study for AM pose. Ended up deepening all the shadows. Above picture is the PM painting in progress and about the last time I enjoyed looking at it. But with one week to go I shall press on and keep learning! I returned from break excited to jump into a two week painting and drawing. While I am improving in my work, I am also improving my ability to see what’s wrong with my work. This can be a frustrating balance as “good enough” really doesn’t make me happy. In drawing, I am beginning to discover my specific weaknesses. Namely – I tend to stretch the torso and enlarge the feet. Recognizing this, I made an effort to restrain the legs in the above drawing. My initial choice wasn’t enough, I continued to hack off the knees as the days went on. Poster study for the two week painting. Towards the end of the second week, I was excited to find myself really becoming absorbed by the painting process. I felt like I really turned a corner in my ability to trust myself and see what colors I needed to use. I thought perhaps it was the Euan Uglow book I’d been pouring over one day at break. I find his work very inspirational and adore his resting place somewhere beyond a poster study. I could look at his work for hours. You can see the same “long limbed” issues in the below painting. If it had been a longer pose or a final piece I would have taken the time to fix them, but my goal was really to focus on color, shadows and light. One of the benefits I was hoping to gain from this program is the ability to sit with a drawing and really commit to accurate, realistic work. I confess I’ve been a lazy artist and have truly wanted to pull myself out of that rut. My time at Studio Escalier has done just that. 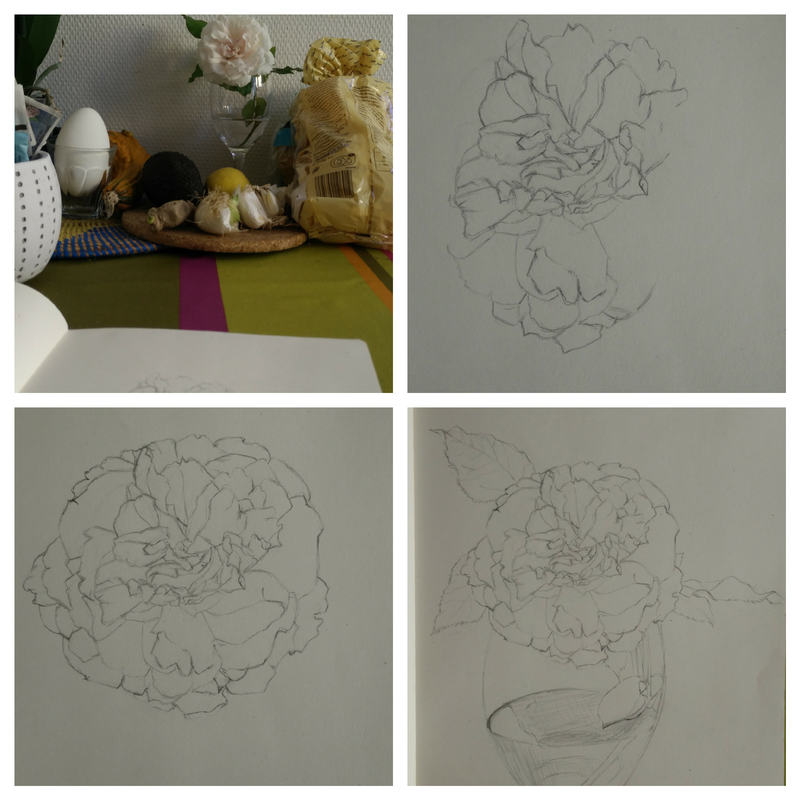 In the past, drawing a rose would have been a quick exercise in not paying attention to much of anything. This past week I found myself engrossed in the myriad of details. What I know now is that there is never “too much” detail. I don’t need to be afraid of the depth of the drawing. The trick is to find a place, commit and stay organized. I hope to complete many more such exercises in patience and exquisite detail. There are three weeks remaining. 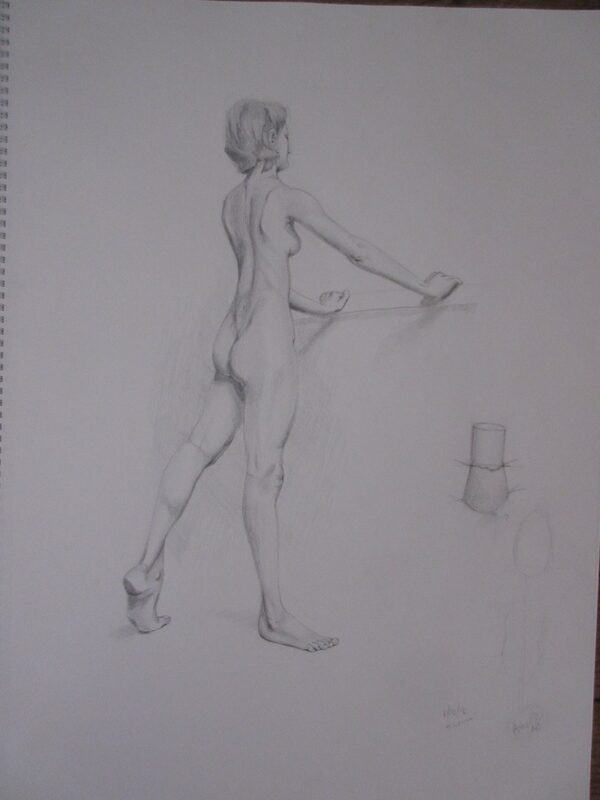 Today we begin a three week pose for drawing and painting. Our AM sessions are normally drawing, but we will have the option to turn our drawing into a painting in the next week. So I’m hoping to complete two more paintings before I leave. We will see! I am staying committed to the learning experience, not creating precious finished works. Ok, I’m ready to share some painting with you. It isn’t pretty, but it is much better than it was. Don’t forget, you can click on pictures to make them bigger. At the end of week 5 the students at Studio Escalier were blessed with a week’s vacation time. In my ultimate wisdom I had chosen to travel to sun and sea in Cinque Terre, Italy. With overcast, cool, rainy weather in Argenton-Chateau, a week of warm bliss was most welcome. It was beautiful. 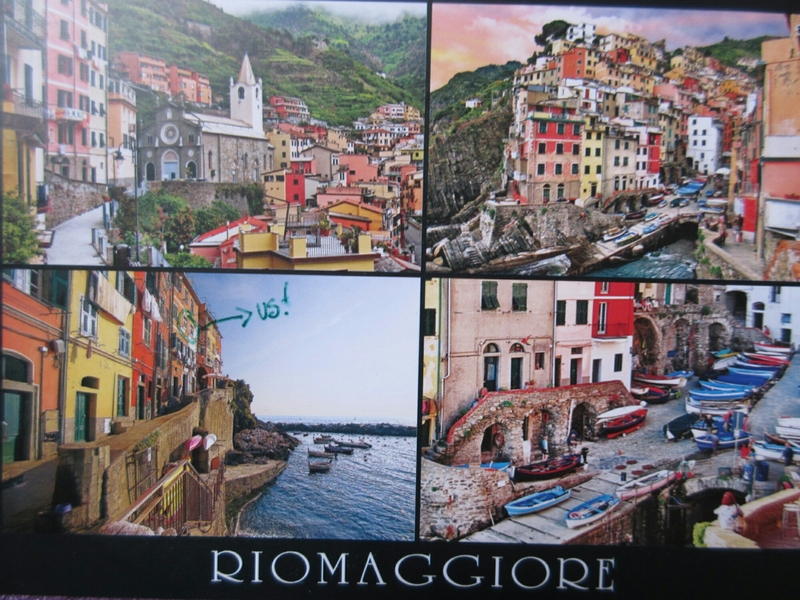 I stayed with my parents in the town of Riomaggiore. You can see where we stayed on most postcards. Dad and I hiked part of the trail that winds along the cliffs. The first part of it was closed due to flood that occurred in 2011. While 17 million Euro (that was the number I thought I heard..seems a little high) was dedicated to repair the trail system, it seems to have disappeared (according to a tour guide I overheard). 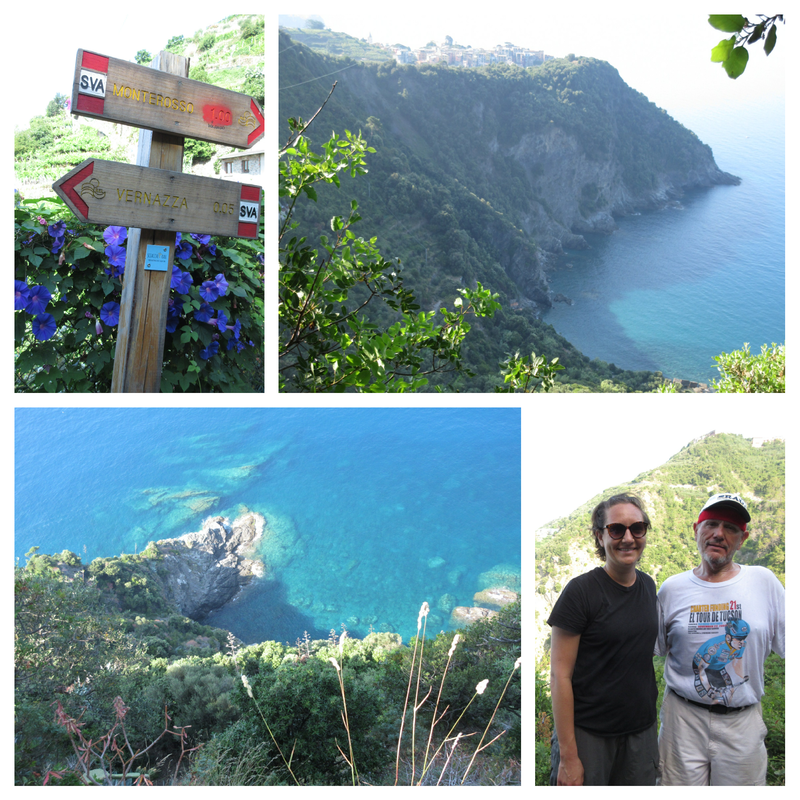 We were able to hike from Corniglia to Monterosso. The UP was quite steep but manageable. The trails were VERY narrow (in places we had to squeeze by other hikers while gripping the rocks behind them). The view was marvelous. That water…I spent a week floating in it. Incredible. On the way back I was so happy to stumble upon an Alfons Mucha exhibit (in Genoa). Most people are familiar with his work and it is truly lovely. What really astounded me are his studies. There were a great deal of his drawings displayed. Mucha made a conscious choice to pursue the art nouveau style from a deep understanding of classical works. ok – Painting…So these first two images show what I have been working on for about 4 weeks. I think they are terrible, but now that I have something slightly better I don’t mind sharing them. We have been working on two types of color studies – poster and rounding. The idea is to record the colors and light correctly to prepare for more in depth painting. So this first group of 3, not so pretty. You can see how my most recent poster study below shows a bit more understanding of color and light. I still find painting to be completely exhausting. And below is week five’s drawing. 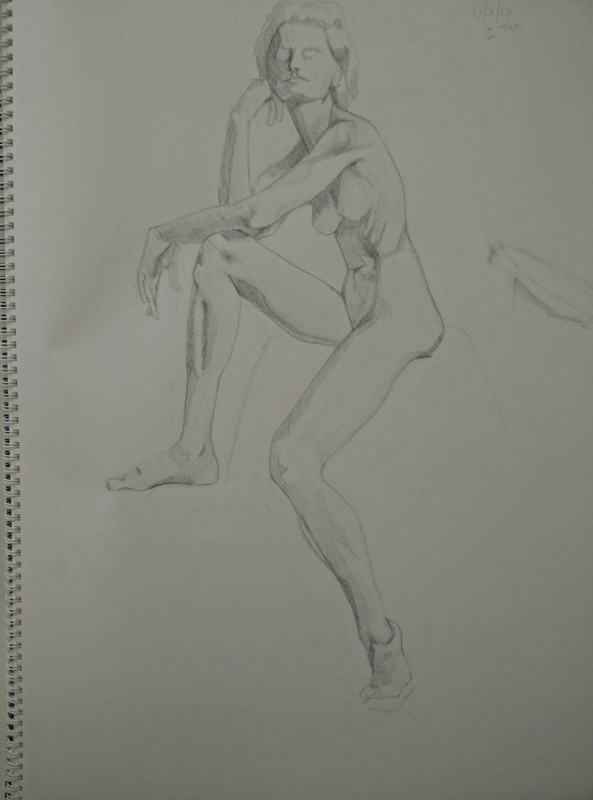 In class we are currently working on a 10 day pose. While we are technically only halfway through the course, I feel like the end is just around the corner. I’m hoping that my subconscious soaks up enough information to help me at home! 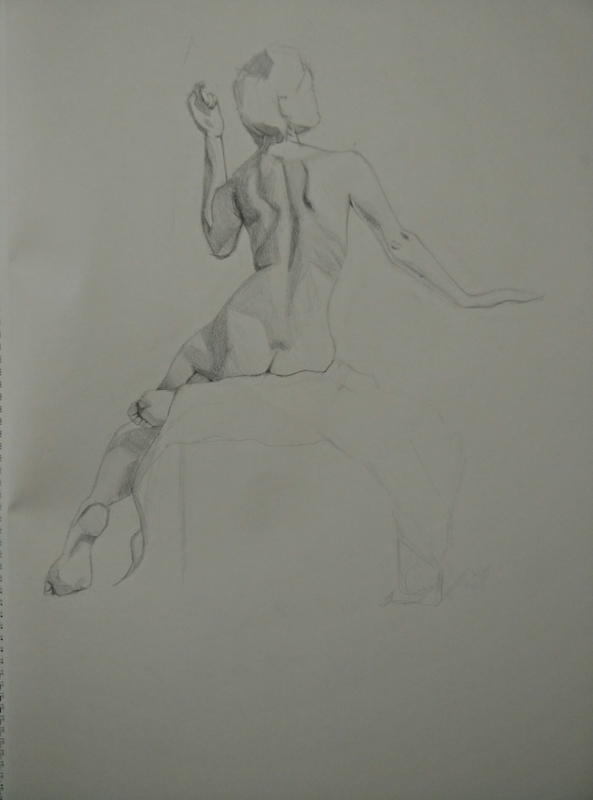 We were so lucky this week – a 5 day drawing pose! I think they get longer from here on out. There are so many little improvements. These lead to such a deeper level of critique. In the painting realm we shifted to a new technique. This is far easier for me to approach and I’m feeling much better about my work. It isn’t really all that great yet, but I’m seeing a brighter horizon. 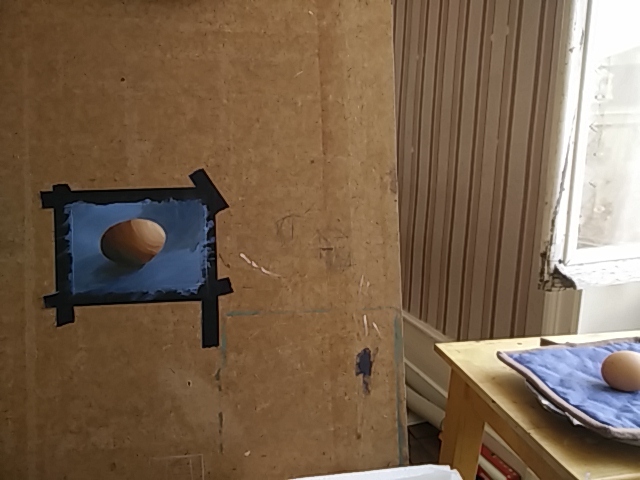 Homework was to paint an egg, as you can see below. I’m still too self conscious to post pictures of my in class paintings. Maybe next week. At the end of next week I will be halfway through the course! This week I participated in a game of Ultimate Frisbee. I have never gotten so much exercise in such a short period of time. I sprinted over 5 miles and I am hooked. I’ve already started looking at San Diego pickup games. I’m getting ready to head out for another round in an hour! Last night was potluck night in our student housing. It was absolutely beautiful. Everything you could want for a potluck in the French countryside. Cool air, beautiful food, great wine and lovely people. I’m missing my kitties, Daniel and not much else. I’ve built up to 25 minute runs every other day and 53 pushups. I’m starting to daydream about my life at home and how I can maintain this environment. I’m not sure it’s possible. Now I wear hats. Painting gear, ready to go. This is my egg study. I won’t say it’s awful, but there is a lot to be desired. Practice. I don’t have a great deal of experience painting realistically. Ok, I don’t have ANY..you may notice most of my figures are blue, purple or red. And I haven’t used oil paints in 10 years. This past week has been dedicated to the poster study. My job is to break the form into little abstract shapes and generally paint the correct color. Every day this week I have felt like I’ve been twisting my brain like a wet towel trying to squeeze something out of it. I go home pooped at 5:30. I haven’t been able to join in the Ultimate Frisbee activities because of the mental energy I’m exerting on color matching. Additionally I have not been able to stop singing “Golden Brown” by the Stranglers under my breath as I attempt to mix the perfect golden brown. I think…I THINK… I am approaching some sort of understanding with the paint that is going to get me somewhere in the vicinity of the right direction to accomplish some sort of goal. Today’s painting seemed to have the right lightness/darkness and colors (sorta) but looked like it had been painted on with a chainsaw. I’m not even going to bother with pictures (well that and the paintings are all locked up for the weekend and I forgot to bring them home or take a photo). My mantra this week has been “Fail Again, Fail Better” a quote from Samuel Beckett and used as the basis for the current Pema Chodron book I am reading. Fail again, fail better. Yes. Will do. Working on it diligently. On the other hand, DRAWING is in just a lovely little place right now. I have never drawn so well and I know I have much room for improvement. 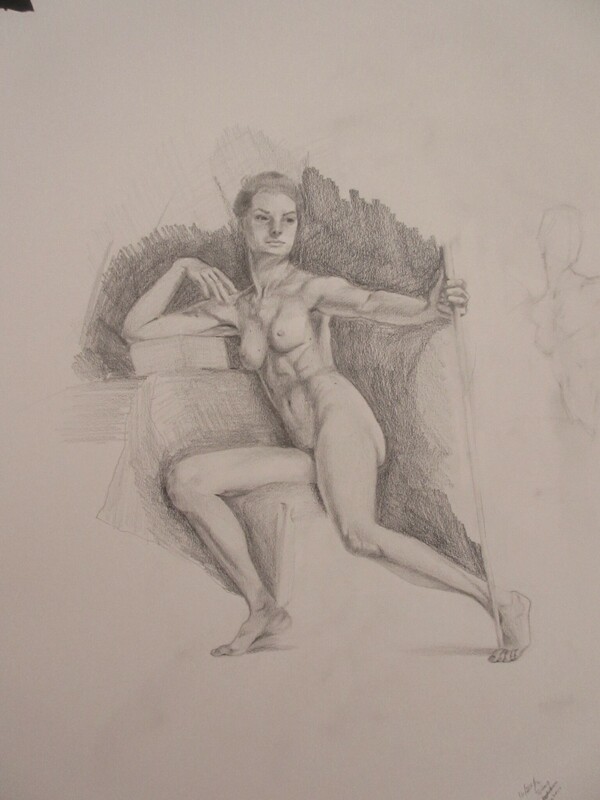 For those of you who don’t spend 30 hours a week in a studio, let me explain to you how figure drawing works. Throughout the world you will find life drawing sessions. For $15 – $25 I can sit in a room with fellow artists and enjoy the privilege of having a model (real person, preferably naked) to work from. This is steeped in classical tradition. Drawing from life is paramount to the success of any artist seeking to represent reality on any level. 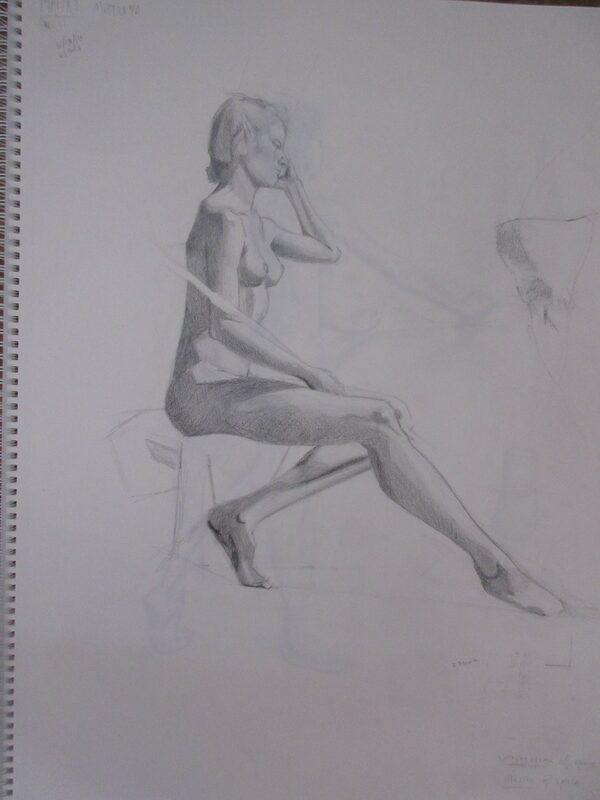 At the public studio sessions the model will twist and turn and offer 1 minute to 5 minute poses as a warm up. 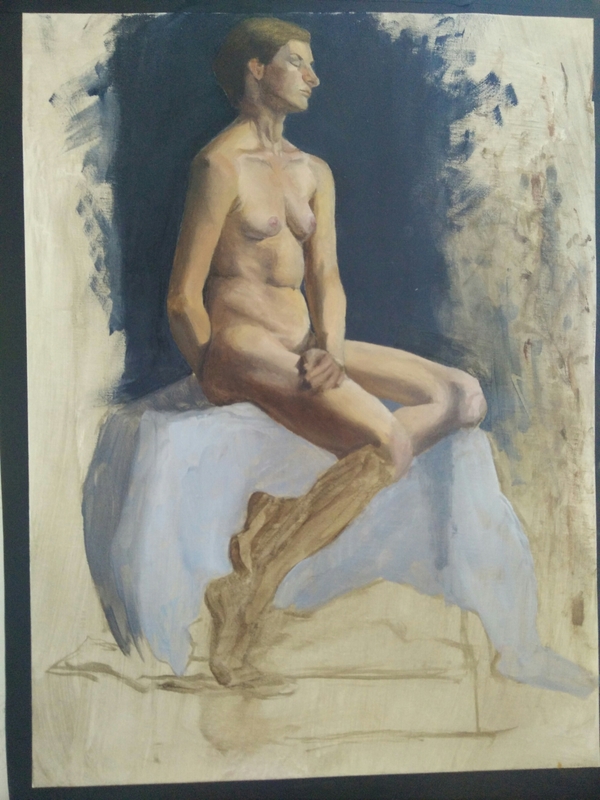 The good stuff happens later… The model will settle in for a 20 minute, 1 hour, 3 hour, 536 hour pose, taking breaks every 20 minutes or so then resuming the pose so we may continue our artistic crusade. An artist who is working from life will hire a private model, find a pose and stick with it for 15-30 hours. The drawings I am posting today were created from 5 hours of drawing over a period of 2 days. Each. I only completed two drawings next week. Drawing and painting well takes time, effort, rent, food and a live human that demands a living wage for his or her time. It takes education, practice and patience. Painting in this realm requires beautiful and expensive materials. When it comes time to sell the results of this labor, a gallery will take 50% off the sale. On top of this, how often do you really think someone is selling their work? Hands down the best thing I have ever drawn. Looking forward to future improvements. THAT is why art worth a damn is expensive. Consider that the artist also wishes to make a living from this and must charge accordingly. I have never met someone who “just wants to cover costs” in order to go to work every day. I’m sure that person is out there, but personally, I want to buy a luxury now and again or go on vacation. It is supposed to take a human 10 years to master anything. Consider what that time, education and investment is worth in the final product. In other news, it has been raining daily. Thunder and lightning. I’m in heaven. I’m also very grateful to take this weekend and do nothing that I don’t want to do. Today was yoga, running, meditation, blogging and some calligraphy practice. I think I’m getting better. Life in Argenton Chateau is very peaceful. I have been running regularly and taking very long walks with my roommate. (She has been the perfect match and I am so grateful.) This week I earned myself a wine and cheese dinner. The wine aisle in the grocery store in incredible. There are at least 4 Grand Cru St. Emillion wines and they are all under 20 euro. I’ll be slowly working my way through the regions. Last week I focused on the Rhone Valley. Maybe I’ll mix it up with some Sancerre. The tiny little regions represented are so cool to see – Clairette de Die, Minervois, St. Joseph – in spades! The drawings are coming along. I am really in awe at my own progress (I don’t think that’s vanity – just genuine delight!). I have gotten to the point where all drawings created previously (we will refer to this time period as Pre-SE) are mortifyingly off. I will accept them for what they are…stepping stones. Here we have a series of 2.5 hour drawings from this past week. The model is so elegant, poised, statuesque and strong. I can’t imagine drawing anyone else again. 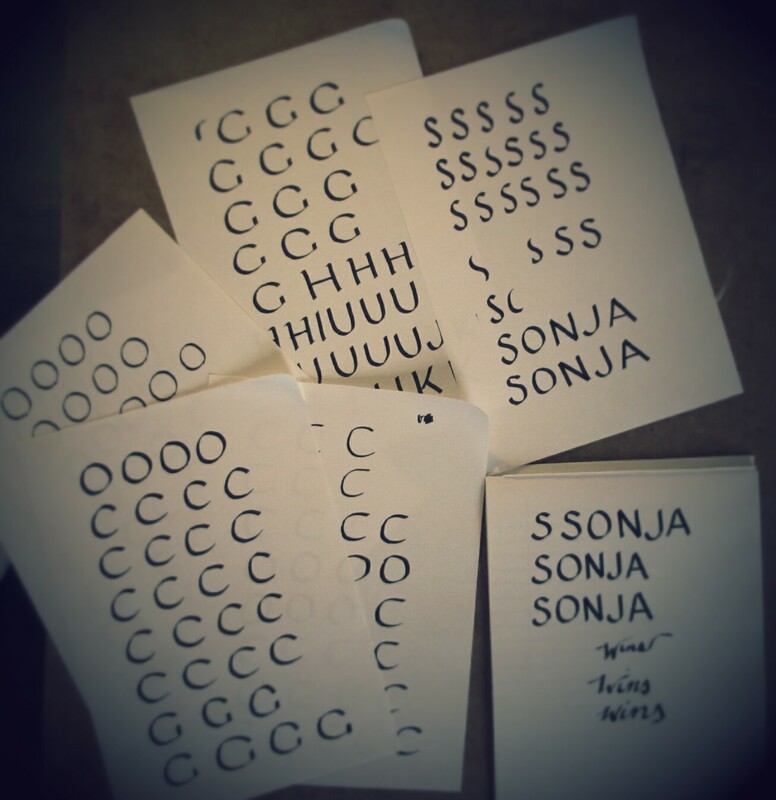 These are still technical drawings, in stages of development. In the coming weeks they will continue to grow in complexity. Click on the image to see a larger version. I know the colors are terrible. I don’t really care enough to fix that. And there are plenty of messy things happening in the below artwork. I’m sharing my progress, not my perfection. On Wednesday we began painting. Now in this realm I am COMPLETELY inexperienced. I paint, have always painted, but it has been many years since I’ve used oils, never this high of quality (or variety of color) and I have never given a hoot about representational colors. I think that I will make progress quickly but woa. This is my first attempt at a figure painting in the poster style. Tolerable would be my assessment. This painting was corrected 100 ways by the instructor. Very grateful, something to strive for. Not my work. 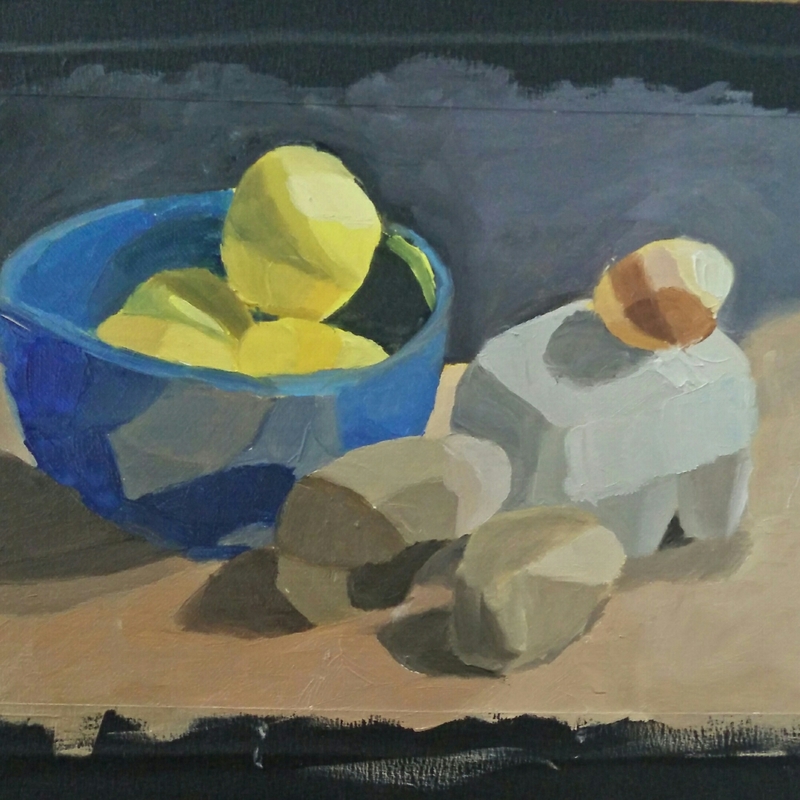 This morning I completed this practice still life to continue working on technique. Homework! This is where I spend my days.